This fun and insightful 56 page booklet illustrates the difference between life-alienating and life-serving language. 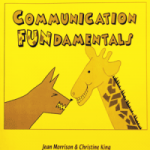 Using jackal and giraffe drawings, Communication FUNdamentals will guide you through the tools and consciousness of Nonviolent Communication as developed by Marshall Rosenberg. Magnetic GROK is a set of 180 Feelings, Needs, and connecting words (please note there are 3 blue sheets of words, and only one is shown in the photo) that can be placed on your refrigerator or any magnetic surface. Play with these words daily to help you deepen your understanding of yourself and others. Bring mindful awareness to each day for discovery, connection, and fun!